A man died in custody after patrol car officers deliberately ran him over before using a baton and CS gas to restrain him, a court heard. 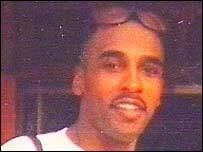 Michael Powell, 38, died after he was detained outside his home in Lozells, Birmingham, on 7 September 2003. Constables David Hadley and Tim Lewis deny battery and dangerous driving. It is alleged officers used excessive force and did not help when they knew he needed treatment. Ten officers from West Midlands Police are on trial. Prosecutor Courtenay Griffiths QC, told Leicester Crown Court that constables David Hadley and Tim Lewis were called to Wilton Street and found 38-year-old Mr Powell being restrained by a friend. Pc Lewis was driving and Pc Hadley was a passenger in the patrol car. "In the minutes that followed, they deliberately drove the police vehicle at Mr Powell, causing him to collide with it," said Mr Griffiths. 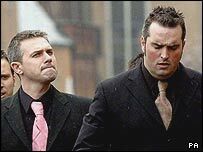 It was considered a joint enterprise as Pc Hadley had encouraged Pc Lewis to drive at Mr Howell, said the prosecutor. The policemen then got out of the car and sprayed Mr Powell and his friend with CS gas. The court heard Acting Sergeant Chris Wilson and Pcs Nigel Hackett and Steven Hollyman arrived at the scene and helped restrain Mr Powell. Shortly afterwards Insp Tony Guest arrived. During this period Mr Powell was restrained on the ground "inappropriately and excessively", the prosecutor said. Mr Powell was taken away in a police van by Pc Nigel Hackett, driver Pc Andrew Edwards and Pcs Luke Gill and Lee Howard. On the way to Thornhill Road police station Mr Powell became unconscious. "By the time he arrived at the police station he was in acute need of medical assistance," said Mr Griffiths. Those present and custody sergeant David Williams were aware of his ill-health, the court heard. "There was by any standards a failure to respond to an emergency," said Mr Griffiths. Mr Powell's mother had called 999 at 0032 BST and by 0157 BST he was dead. However, none of the officers are to blame for Mr Powell's death, he added. Pcs Lewis and Hadley deny battery and dangerous driving. Acting Sgt Wilson, Insp Guest, Pc Hollyman, Pc Hackett, Pc Gill, Pc Howard, Pc Edwards and Sgt Williams all plead not guilty to charges of misconduct in a public office.